Subaru Cherry Blossom Festival welcomes 10tecomai Yosakoi Dance Project to Sakura Sunday! 10tecomai Yosakoi Dance Project is based on the Yosakoi style of dance, which blends traditional movement with modern music. Created in 1954, Yosakoi dancers hold Naruko, which are small wooden clappers, in their hands. This prop adds noise and dramatic flair to an already intense dance form. 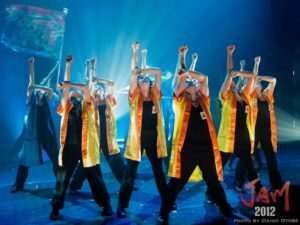 The Yosakoi style has been lauded for re-popularizing traditional dance in present day Japan, and 10tecomai is spreading that popularity on a global scale! Watch 10tecomai’s energetic juxtaposition of the classical and contemporary dance at 12:45 PM & 3:30 PM on the Main Stage! To find out more about 10tecomai Yosakoi Dance Project, visit their facebook page!